It is important that an agenda corresponds to a specific date in the calendar. This is to ensure that no two agendas conflict with each other within a plotted schedule. 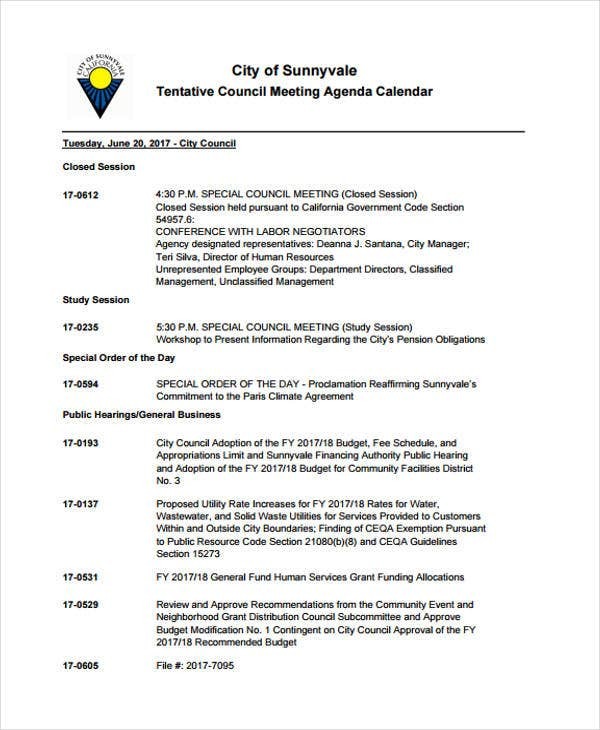 Calendar agenda templates are the perfect aid for this matter. An agenda calendar serves as a reminder sheet to anyone who makes use of it. 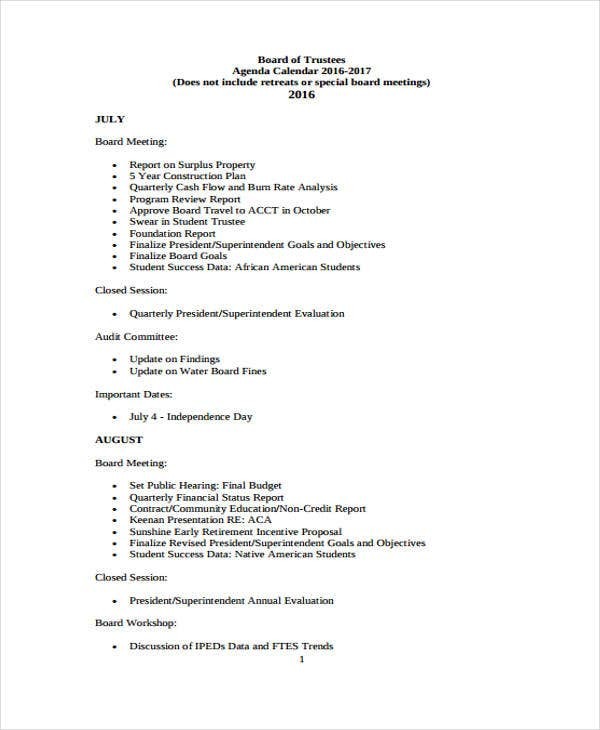 In various organization and association meetings are various meeting agendas as well. 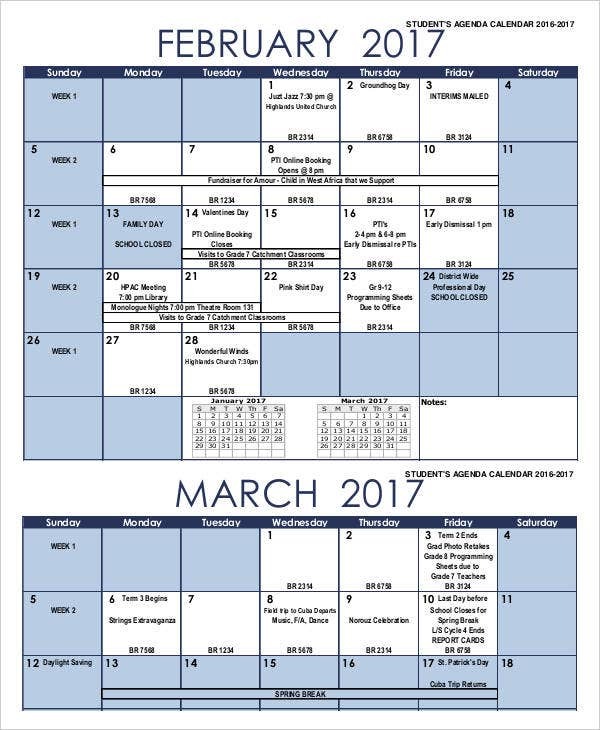 For a more organized and smooth flow of facilitating formal or informal gatherings, agenda calendars serve its purpose best. On this page are agenda calendar templates in simple yet easy to fill out agenda calendar format. Just by looking at a certain date on an ordinary calendar makes you think of a lot of piled up activities. You tend to foresee a busy schedule ahead and at some point, you get to mix up tasks regardless of priority. Summarize monthly activities. A week is too short to prepare for an agenda calendar. Hence, a monthly summary of activities should make up an initial step towards preparing an agenda calendar. 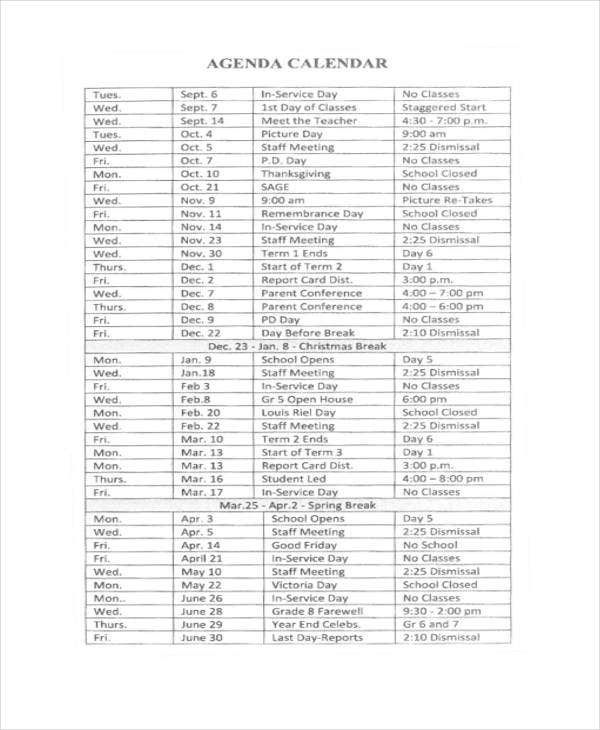 Gather different appointments and obtaining a list out of it. Sort out the agenda. It is up to you on how you sort whatever you have obtained from your summary. Put up the category of your choice and make it your basis on how you’re going to proceed with the next steps. Plot activities. Finally, plot the different activities you have. Start with reviewing every day of every month and double check if a particular day could be a perfect schedule to fulfill a particular agenda. If you plan on creating an agenda calendar for different modes of training, training calendar templates will do a lot of calendar tips for you. 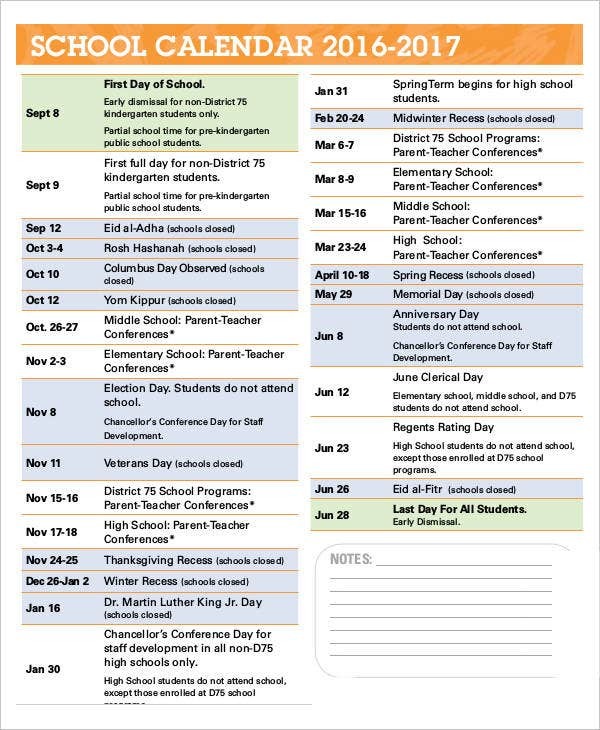 Getting organized with your schedules in a month makes a good year. It is for this reason that an agenda calendar is considered to have a lot of advantages. Accurate Updates – You would know whether a certain day of the month has a plotted schedule or none. By keeping track of an update agenda calendar, you are able to get accurate updates of every day as well. Instant Reminders – By simply looking at a template or printing a plotted schedule in an agenda calendar, you are instantly reminded of a list of tasks to complete a sample daily agenda. Descriptive Tasks – Information on different agenda tasks could come in keywords and phrases for as long as it is able to communicate well to whoever interprets whatever is written. These agenda calendar advantages suggests a well-planned schedule ahead of time. 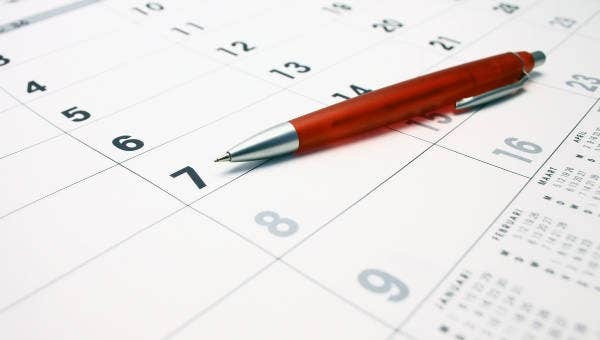 An agenda calendar template is a lot of help, especially when there are monthly schedules that need to be reflected in calendars for reference purposes. 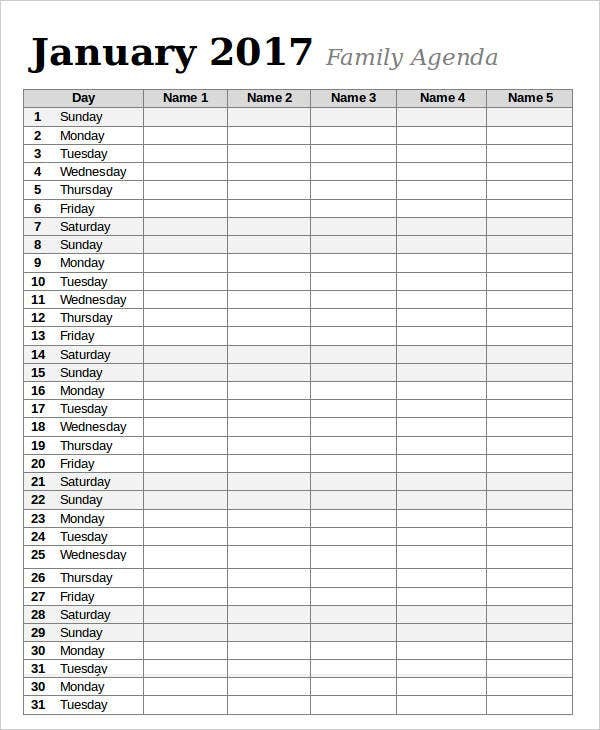 Choosing the right template offered from this page makes it more possible to generate effective agenda calendars that could add up to its list of advantages. 6+ Trip Agenda Templates – Free Sample, Example, Format Download!